In 1983, NASA’s James Hansen showed 9 cm (3.5 inches) of sea level rise from 1880 to 1980, or 0.9 mm/year. The graph below overlays the two at the same scale, normalized to 1880. Impressive data tampering from NASA’s band of climate criminals. But it is much worse than it seems. NASA now ignores tide gauge data because it shows sea level rise slowing since the 1950’s, and instead uses massively tampered satellite data to claim a sea level rise rate of 3.22 mm/year. 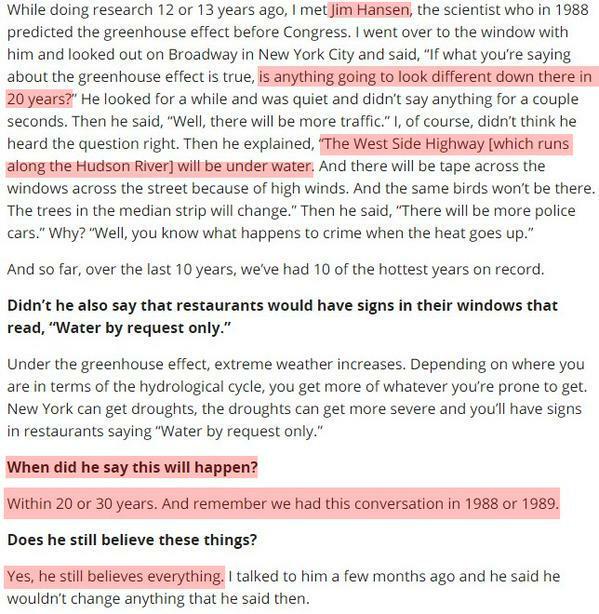 But even at their wildly fraudulent 3.22 mm/year, it will still take thousands of years to drown Manhattan, which Hansen predicted would happen between 2008 and 2018.